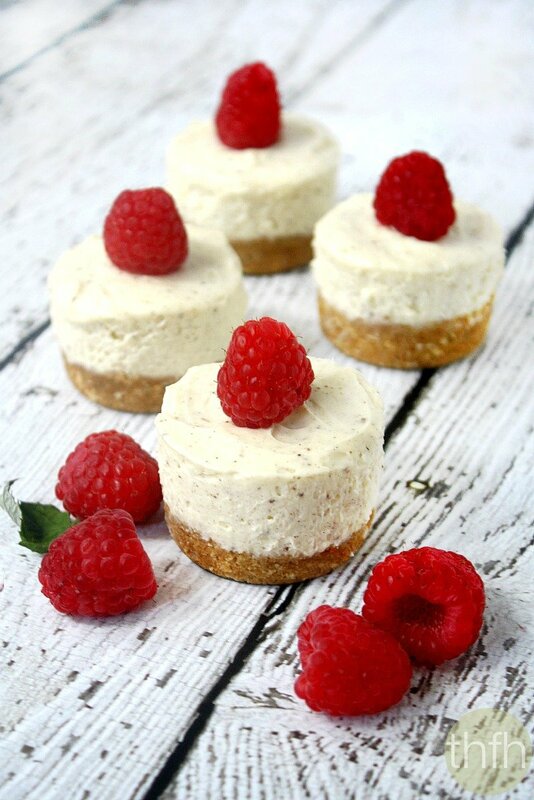 Of all the recipes I’ve made since I started my website, these No-Bake Mini Cheesecakes (Low Carb + Low Sugar) have been the most challenging. I had to stray from my normal ingredient list for this dessert because it was made for a family member (my father) who has strict dietary restrictions. It was his birthday earlier this month and I was put in charge of making him a “special” dessert that met his dietary restrictions, and that he would enjoy. Let me give you a brief outline of the parameters I had to work within. For health reasons, he is on a diabetic, low sodium and renal diet (low potassium/low phosphorus). Since he was recently placed on this restrictive diet, I have had a really hard time trying to come up with foods and meals he could eat. 99% of the foods and ingredients I use on a regular basis, he can’t have…almonds, cashews, avocados, tomatoes, cacao, coconut oil, apple cider vinegar, bananas, walnuts, just to name a few. A renal diet limits the amount of potassium and phosphorus and all the foods listed above contain high amounts of these. Salt (sodium) is another big problem because even foods that aren’t boxed or processed have sodium (example: 1 egg has 70 g of sodium) and that counts towards his daily sodium intake limit. So when I decided I wanted to make him a cheesecake for his birthday, I was kind of at a loss because I normally would have used nuts + coconut oil for a crust and cashews + coconut milk for the filling. Basically everything I would have used to make a healthy, vegan, gluten-free, dairy-free dessert was off limits. So I did a search online and was inspired by this recipe which I adapted quite a bit because I was trying to eliminate the amount of sweetener and keep it as clean as possible. My version was very low in carbs (5 grams per serving), low in sugar (less than 1 gram per serving) and low in sodium (147 grams per serving). The end result….he L.O.V.E.D. it! Anyway, I hope this dessert will help someone out there who faces similar dietary challenges and who still would like to enjoy an occasional treat or for a special occasion. Tip #1: If you didn’t need a low carb + low sugar, low potassium dessert, you could easily convert this to a vegan recipe by substituting coconut oil for the organic no-salt butter, vegan cream cheese for the organic cream cheese and see if whipped coconut cream would work to replace the organic heavy cream. You could also, of course, use your favorite granular sweetener instead of non-GMO xylitol (made from U.S. birch). 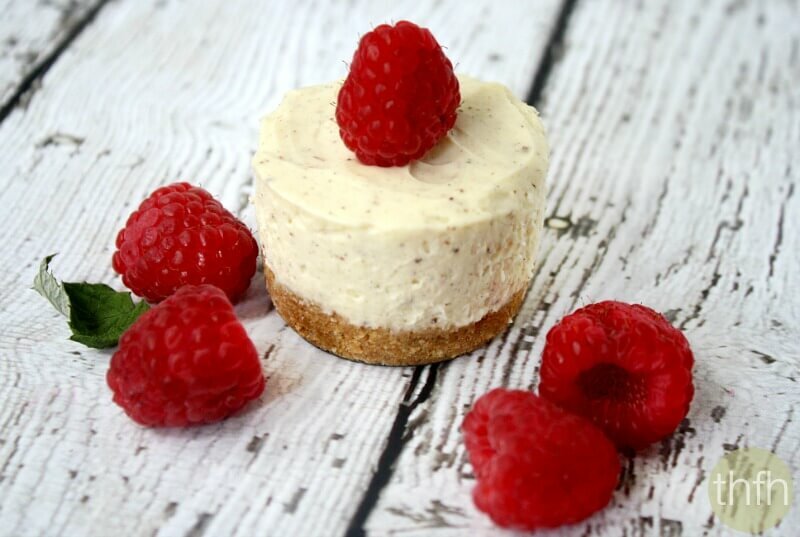 Tip #2: These will have a light and soft “mousse” type texture…they won’t be hard and firm like a traditional cheesecake so you will need to handle them delicately when removing them from the cheesecake pan. Tip #3: This recipe will make 12 mini cheesecakes using this cheesecake pan. Step 1 Add all ingredients for the crust to a food processor and process until a crumbly texture. Divide the mixture between the 12 cavities of a mini cheesecake pan and press down firmly. Step 2 Add the heavy cream to an electric mixer and mix it to a firm peak using the whisk attachment. Remove and transfer to a small bowl. Set aside. Step 3 Add the cream cheese, xylitol and vanilla bean powder to an electric mixer and mix until well blended and creamy. Add the whipped heavy cream and gently blend in on low speed. Divide the mixture between the 12 cavities of a mini cheesecake pan and spread it out evenly. Let them firm in the refrigerator for 1 - 2 hours and carefully remove from the pan. Optional: garnish with your favorite fruit or berry (raspberries, blueberries, strawberries, blackberries, kiwi, etc).